The video below is a scene from the Paramount motion picture The Ten Commandments (1956). In this scene, "Nefretiri" (Anne Baxter 1923-1985) is playing the Hounds and Jackals Game with "Pharaoh Sethi" (Cedric Hardwicke 1893-1964) who sits opposite her. The other man in the scene is "Minister Jannes" (Douglas Dumbrille 1889-1974). As is sometimes the case, Hollywood did research and appropriately chose this as a game that could have been played by royalty in ancient Egypt. To see and hear the scene in which the game is played, move your cursor onto the video and click on the controls in the lower left corner of the video. Moving your mouse away from the video removes the controls. H.J.R. Murray in Board Games Other Than Chess (Oxford, 1952, pages 15-16), indicates that the name of this game is unknown. He states that it is generally called "Dogs and Jackals" by Egyptologists. David Parlett in The Oxford History of Board Games (Oxford, 1999, pages 68-70) remarks that the game has a number of contemporary names based upon the design of the boards and pieces found. It is often called "Dogs and Jackals" or "Hounds and Jackals" because of the shape of the playing pieces. Sometimes the game is called "The Shield Game" because the board is shaped like a shield. Some refer to the game as "The Palm Tree Game", because of a board that contains the design of a palm tree on it's face. Both Murray and Partlett indicate that this must have been a popular game from the 9th to the 12th Dynasties since a number of boards and game pieces have been found in archeological digs from Egypt, Summer, Elam, Assyria, and related areas. While the boards or fragments of boards that have been found all have a rectangular shape and have holes on a track, the Egyptian boards are curved at one end. The holes are for use of pegged playing pieces. At a dig in Thebes, Egypt, a board was found with ten carved ivory pins, half with heads of dogs and half with heads of jackals. That find appears to be the basis for the one created for the Paramount film. These throws enable a player to move from one to five holes dependent upon the method of play established. Murray and Parlett as well as others who have "reconstructed" this game offer detailed instructions for the play of the game. There is a playable commercial reproduction of this game. The photograph on the right is the painted plastic container for storing the game. The game set was manufactured by Pyram Enterprises, Inc., N.Y., in 1993. The set was acquired in 2004. The set includes a board with holes similar to the board used in the motion picture, a set of ten peg - five each of "dogs" and "jackals" - but instead of "throw-sticks" this reproduction makes use of a special set of dice. 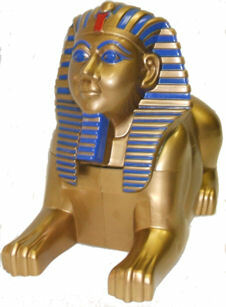 To see these game components and read detailed instructions on how to play this game, click on the Sphinx graphic on the right.